With the release of the new Delta Unisaw, also comes the release of a new line of premium saw blades. To find out what the masses wanted in a saw blade, Delta visited more then 100 professional woodworking shops to gather feedback from over 200 professional woodworkers. Using this feedback, Delta increased the size of the carbide on the teeth by 50 percent, allowing for additional resharpening down the road. The blades also feature laser cut expansion and harmonic body slots to reduce blade noise and vibration. Here comes the part I like. Delta laser-etched sharpening instructions on to each blade, so you can be sure your sharpening center can match the sharpening to the original Delta specs. Lets just hope they follow those instructions. 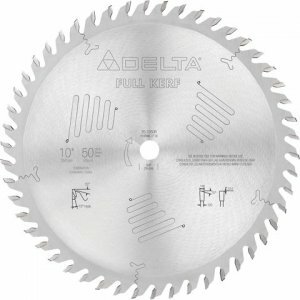 The new Delta Full-kerf saw blades are manufactured right here in the USA and use C4 sub micro-grain carbide that is said to improve the quality of cuts and lengthen blade performance. The blades will range in sizes from 10 inches to 12 inches, with 5 additional blades from 220mm to 300mm. Based on blade model, tooth combinations will be available from 40T to 100T. Prices range from $75 up to $130.